Exclusive Beach Colony is located on 11 acres of fabulous beachfront. The ingenious angular living room design transforms every residence into a Corner unit. Wall-to-wall sliding doors and adjoining windows actually wrap around the living room, filling it with light, and revealing the panoramic beauty of the Gulf. The sweeping 300 SF terrace will be a favorite spot for quiet moments and lively gatherings alike. The uniquely situated Master Bath is a world unto itself. The whirlpool bath is surrounded by large, wrap-around windows, which can open to offer both a view and a feel of the hypnotic Gulf. 1497 SF with Tile throughout Living, Dining, Kitchen and Carpet in Bedrooms. Electronics include 50" 4K Ultra HD Smart TV, DVD, Stereo, CD in Living Room, 32" TV, DVD in Master Bedroom and 32" TV, DVD in Guest Bedroom. Assigned covered parking space is included. Had to call about the hurricane shutters and agent told us how to control them and volunteered to come by and open them if we wanted her too. This was out second stay with your company and you are always easy to deal with and your properties are always really clean. We will be back again and plan on renting a property from you. Thanks! All explanations were clear and to the point at the check-in desk. The maintenance workers and cleaning staff were very friendly whenever we would meet them in the halls or elevators. We had a fabulous stay and the condo 9B was beautiful, clean, and comfortable. The owners did such a great job decorating and the views were breathtaking. A customer, for, many years now, the staff is professional and respectful. A better experience, cannot be found. Awesome, from begining to end. We've stayed at this property, on prior trips, and, it never disappoints. Condo, was even better, than, described. Life at it's best !! 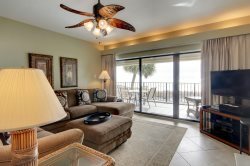 The Perdido Realty staff was extremely warm and helpful. Check in process was easy and fast. They gave us a packet of everything we needed to know. We were so glad to have excellent customer service! Our condo was superb! Up to date, clean and tidy. It felt like home without being cluttered. We had everything we needed! I absolutely love working with Valerie. She is always so helpful in helping me choose the right condo for our needs. We love staying at Beach Colony this was our 4 th visit at the Beach Colony. Beautiful Unit - Great Layout!